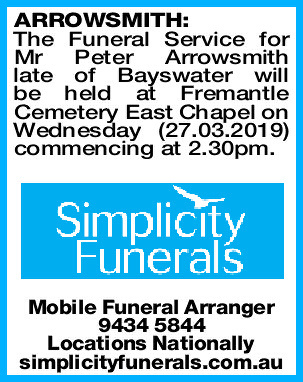 The Funeral Service for Mr Peter Arrowsmith late of Bayswater will be held at Fremantle Cemetery East Chapel on Wednesday (27.03.2019) commencing at 2.30pm. 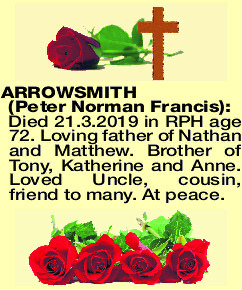 PETER NORMAN FRANCIS Died 21.3.2019 in RPH age 72. Loving father of Nathan and Matthew. Brother of Tony, Katherine and Anne. 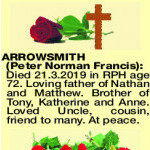 Loved Uncle, cousin, friend to many. At peace. The President and members of the RAN Band Association extends sincere sympathy to Anne on the passing of her brother. Yet another talented link of our musical chain departs.